What grammarians say should be has perhaps less influence on what shall be than even the more modest of them realize; usage evolves itself little disturbed by their likes & dislikes. And yet the temptation to show how better use might have been made of the material to hand is sometimes irresistible. If the history of the English usage wars shows us anything, it’s how overpowering that temptation has proved, and still proves, to be. No special training is required to be an amateur grammarian, and so the annals of language commentary fill with unfounded peeves from those who like to tell other people they are Doing Language Wrong. Of course, there has always been an opposing force from those who know the perils of setting usage advice in stone, of saying a certain word must mean this and never that and so it should be forevermore. Decrees of this type may be out of date by the time they’re published, and can seem particularly odd or surprising a mere generation or two later. 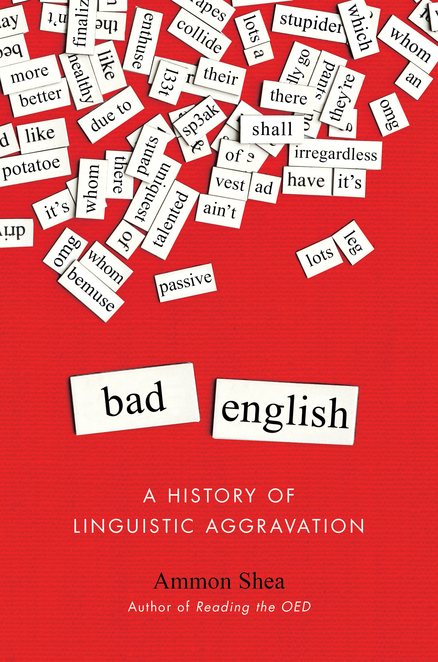 Ammon Shea’s new book Bad English: A History of Linguistic Aggravation (a copy of which I received for review from its publisher Perigee Books), is a very welcome addition to the canon of usage commentary. It is light yet scholarly, explaining disputes in a clear, informed and entertaining fashion and proceeding in each case to a sensible conclusion. You can use funner and funnest, but you should bear in mind that anyone who chastises you for this use is unlikely to be interested in hearing your explanation for why it should be acceptable. These words will grate on the ears of many for some while to come. Bad English selects a medley of problematic usages and traces them back through historical byways. It presents a colourful assortment of tirades, some well-known, some obscure, each offering a window into how various words were received when they first entered English, became popular, or dared to broaden their repertoire of grammatical categories. The problem is that, while many people accept that our language is subject to change, they want to dictate what sort of changes will take place and that is a very difficult thing to do. A recent edition of the BBC style guide warned about “Americanisms” such as euthanise/-ze. This word in fact appears to be British in origin, as are most of the verbed nouns the style guide censures in its chapter on Americanisms. Bad English wryly notes that verbing has obviously been part of English “since hundreds of years before the concept of the United States was a mote in the eye of George III”. Approximately seven hundred thousand people sent in suggestions in an attempt to win the $100 prize, which was split between two people who sent the same word. That word, which has utterly failed in its intended goal of replacing jazz, was synco-pep. Another competition in 1949 offered $1000, and the winner, crewcut, likewise “went on to have no effect whatsoever upon the language”. There is a useful passage on the ragged history of apostrophe use, though Shea says it’s “should be used only to mean it is”, apparently forgetting that it also commonly means it has. In another minor lapse, he writes that we tend to modify unique “with an auxiliary word, rather than a prefix” – but suffix (or affix) is the word needed here. Bad English is sometimes very funny, a quality rather rare in books in this genre. The humour manifests not just in Shea’s writing but in the material he draws on and in its arrangement, as for example when he quotes a 2006 study guide deploring different than, then quotes the same book using different than. Study guides come in for further criticism. After exploding the myth that you shouldn’t end sentences with a preposition, Shea finds the rule still upheld in two places: internet comments and college writing centres; the latter fact he finds “quite distressing”, but hopes students will pay no heed to this “nonsense”. The book concludes with 221 words that were once frowned upon, paired with grumpy denunciations that may invite speculation on the psychology of not-a-word prescriptivism. Standouts include Isaac Asimov on interface (“What’s wrong with ‘interact’? When I interface with a girl, I’m kissing her, by God”), and Richarde Willes, who in the 16thC attacked several words for “smellynge to much of the Latine”. Bad English aims to examine issues “commonly thought of as mistakes in English usage” over the centuries. Its author describes it as both a history of what we think is correct and why, and a celebration of “the marvellously flexible language that has allowed room for such myriad forms”. On this basis and more it is an outright success. You can order it from your preferred bookshop via Penguin Books. This entry was posted on Tuesday, August 26th, 2014 at 9:05 pm and is filed under book reviews, books, language, language history, usage. You can follow any responses to this entry through the RSS 2.0 feed. You can leave a response, or trackback from your own site.